Two years ago, we could not have imagined the political reality in which our country finds itself today – a democracy turned corporatocracy, led by an aspirant king with an Interior Secretary as henchman and the congressional majority as accomplice. For national public lands, this spells danger: a flagrant attempt to take the “public” out of public lands by shortening comment periods, ignoring input, and sidestepping the National Environmental Policy Act. This hostile administration is violating the Antiquities Act by changing monument boundaries without legal authority. It is trying to eliminate federal laws proven to mitigate damage to wildlife habitat, water, air, and climate. It facilitates destruction of core wild lands, serving them up on a silver platter to motorized recreation, the fossil fuel industry, and other land exploiters. For those who love wild public lands, we’ve turned—by necessity—to stronger and more strategic defense modes. How do we focus our energies, with so much under attack? Environmental battles are never easy – and they’re never over. As individuals, we care about wild places for their capacity to create a sense of awe, connection, and renewal. We protect places of the heart: perhaps a backyard where we watch birds at the feeder, the nearby national forest where our children or grandchildren play, or a faraway and beloved place where we hike with friends, fish with family, or sit alone beneath a majesty of stars. We protect what we love, wherever it may be. 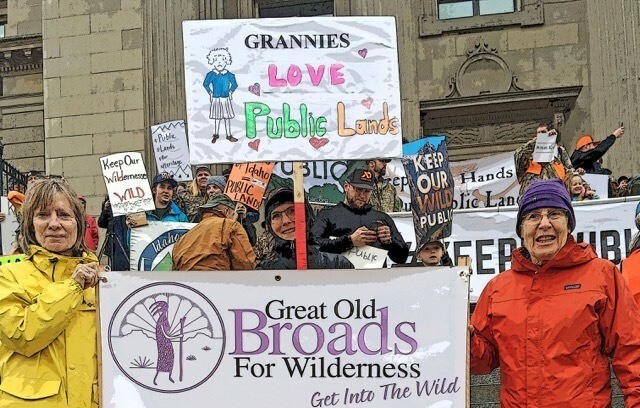 As a national organization, Great Old Broads for Wilderness (Broads) has organized to protect the lands and waters we love through more than 40 grassroots chapters – from southwestern canyons to coastal California, from Minnesota’s lakes to Georgia’s Blue Ridge Mountains. Our chapters (called Broadbands) welcome all who love public lands and commit to defend them. Our members share the belief that wild places, once destroyed, are gone forever. They know that grassroots power, watchdogging on the ground, and focused advocacy are critical to public lands protection. While we’re driven to defend particular places, it’s the formation of community and connection that keeps us coming back time and again. The fight for wild lands requires tenacity. The threads that connect us to each other and to the land create indefatigable wilderness warriors who last a lifetime. Conservation requires more than passion. It requires tools and resources to support citizens as effective change makers. Knowledge is power, and Broads is thrilled in 2018 to celebrate ten years offering a week-long training program to build a collective of wild land advocates. Each spring, we offer Wilderness Advocacy Leadership Training Sessions (WALTS) to volunteers who pledge to start a new chapter or take on leadership of an existing Broadband. The experiential training teaches grassroots organizing, the ins and outs of public lands management, and women’s leadership skills. WALTS prepares leaders for every level of activism – education, community engagement, stewardship, and advocacy. We support leaders throughout the year with online resources, webinars, regional or national gatherings, and personalized guidance. Paying it forward: Broads’ success is rooted in deep connections to local networks and the ability to collaborate with nonprofit and agency partners. The demand for strong grassroots organizing reaches far beyond a single organization’s capacity to effect change. In response to requests for women’s leadership training, Broads will host a second workshop this year, in August, open to our partners and the public. Keep Wild Lands Wild. The Central Oregon Bitterbrush Broadband fell in love with the Ochoco National Forest for its solitude, quiet, and dark night skies. The volcanic landscape boasts unusual rock formations, lush meadows, and biologically unique scablands. Broads became intimate with the Ochocos through campouts, projects with the Forest Service like planting milkweed, and exploratory hikes. When the Forest Service proposed a 137-mile off-highway vehicle (OHV) trail system, the Broadband submitted comments for the Environmental Impact Statement. With a retired aquatic biologist and a retired Oregon Department of Fish and Wildlife fisheries biologist active in the Broadband, the comments were detailed and extensive. By getting on the ground, the group was alerted to a proposed OHV crossing at Deep Creek, refugium for the imperiled redband trout once abundant in the Ochoco Mountains. Deep Creek is a tributary to the Wild and Scenic North Fork Crooked River, where the Broadband held a campout and observed how the proposed OHV crossing could lead to widening of the creek, allowing it to warm while introducing damaging sediment to the stream. They foresaw noise disturbance and habitat fragmentation from OHV trails multiplying across the landscape. In 2017, the Ochoco National Forest approved the trail system, in spite of strong opposition from nearly every forest user group, including conservation groups, hikers, hunters, anglers, ranchers, landowners, and even the Oregon Department of Fish and Wildlife. Comments filed against the project documented the National Forest’s failure to comply with federal laws, including the National Forest Management Act and the Endangered Species Act. When concerns about the project were not addressed, Broads joined as plaintiff in a lawsuit represented by the Western Environmental Law Center. Broadband co-leader Joanne Richter developed standing (the capacity to bring suit in court) through visits to the Ochocos, and provided her declaration as part of the suit. The oral argument is scheduled for May 2018. In the Ochoco Mountains, Broadband members moved from passion to knowledge and ultimately to the courts, armed with background information to defend the lands they love. Keep public lands in public hands, and make them part of the solution to climate change. Few people know southern Utah wildlands as Steve Allen does, having spent more than 7500 days hiking and leading trips in the Bears Ears and Grand Staircase-Escalante areas since 1969. Historian, author, and long-time canyoneer and explorer, Steve has spent significant time documenting both historic and ancestral Native American sites. He’s interviewed scores of local residents for his book, Utah’s Canyon Country Place Names (Canyon Country Press, 2012). Topping his concerns, and ours: exploitation of fossil fuels and uranium. Indeed, The New York Times recently obtained internal Interior Department emails that prove access to coal reserves played a key role in decisions to shrink Grand Staircase-Escalante by a million acres; oil, gas, and uranium access were central to the 85% reduction of Bears Ears. From Public Lands to D.C. Honing skills does not happen instantaneously in a classroom. Broads’ educational campouts, called Broadwalks, give a chance to see, touch, smell, and directly connect with wild lands, understanding threats and protection measures. Participants roll up sleeves to give back to the land, explore wild landscapes, and spend evenings under the stars interacting with expert presenters. They turn experience into advocacy, ending with a mass letter-writing session to send powerful, personal messages to Congress. In September of 2017, 60 members spent five days in Colorado’s South San Juan Mountains to explore opportunities to protect wildlife corridors for wilderness-dependent species like wolves, grizzlies, and wolverines. Just a few months later, 20 citizens hand-delivered letters in meetings with congressional representatives. Teaming up with the Endangered Species Coalition, they lobbied for the Wildlife Corridors Conservation Act, carrying their message from the South San Juans. An integral step in the grassroots process, advocates gained confidence to speak succinctly and passionately, developing relationships with political decision makers. From local issues to national advocacy, Broads engages and inspires activism to protect our nation’s wild public places. In tough political times, as always, we gain strength by getting outside, feeling community and camaraderie, laughing together, working hard on projects, and becoming the most effective advocates we can be in the halls of Congress, the courts, or the streets. Like all activists today, we stay focused, hold tight to our values, and know we’re in this for the long haul. For wild land defenders, there’s simply no other way to be. Shelley Silbert is Executive Director and Lauren Berutich is Grassroots Leadership Director for Great Old Broads for Wilderness. See greatoldbroads.org for more information on how to help the Broads save wild places.